New here, just jumping in with both feet, hope you don't mind. 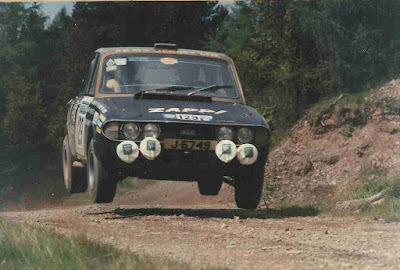 I'm doing a little research into the fate of the Triumph 2.5PI Rally Cars that competed in the 1970 World Cup Rally. Most of the detail about the works cars is known but there's one I;m interested in that was "semi" works - a works prepared car funded by privateer Bobby Buchanan-Michaelson, built mainly by Abingdon alongside their other World Cup cars. It had rally number 1 and started the rally at Wembley. It failed to get to South America and was driven back from Nice (I think) with it's rear suspension broken to get parked up at Abingdon. About that time the Rover P6 Marathon de la Route Nurburgring was also brought back to Abingdon. Now I'm no Rover officianado but legend has it that this P6 was Repco or Traco engined and was one of two maybe even three cars made. There could have been a few Repco engines around. So fast forward 30 years and a story about car number 1 turns up, the story is that it was seriously "rodded" with a live rear axle, huge drag strip V8 inserted and was frighteningly quick. It had been re-registered but the chassis plate was correct. Anyone know where I could start unravelling this myth/mystery/flight of fancy. Was that 2.5 PI Abingdon-built? It gets no mention in the usual sources (eg. Bill Price). The works PIs and Maxis were built in Comps Dept and the private 1800s by Special Tuning Dept. I am interested in seeing any photos of one of the 4 privately entered Hunters, the Unett/Fuller/Tyrell car, that I understand also failed to get out of Europe on the event (we know its later history). Isn't Roy Fidler still with us? (David Benson is'nt?) Contact via "Ecurie Cod Fillet"? - I think Don Barrow's site has a reference? I was at scrutineering for the event but like a lot of rally people resented the marathons at the time for the damage done to the normal Internationals, so wasn't greatly involved or excited. Only now does it seem interesting! Even finding the entry list is difficult. Ken Green (?) has most of the data I think but it's still not on his site. A further bit of info. Brian Moylan in "Works Rally Mechanic" refers to assisting "Roy Fidler's privately-prepared Triumph" at their works service point at Titograd (wrongly-fitted shock absorber protection plate). Brian (who is currently secretary or chairman of the Abingdon/Works Centre of the MG Car Club) wouldn't have said that if it had been fully built at Abingdon? I've got that Brian Moylan book somewhere, I'll go re-read that bit. Roy Fidler is definately still with us and has been in contact with the new owner of the car - interestingly he didn't recall much of the escapade - he was "bought" in by Buchanan-Michaelson to drive and didn't even see the car prior to the start! Told some interesting stories of Mr B-M's generosity on a night out when he and Benson were signed on to crew the car. Yes you did see one at Silverstone, in fact you might have seen two 2.5PIs - both are owned by a guy called Pat Walker, a good guy who I've spoken to at length - the East African Safar rally car was outside and the World Cup car was inside. The World Cup car is the re-shelled XJB304H, the Cowan/Coyle/Ossio car. ...are we talking of 1970, 1971, 1972....? Carles, it must have been 1972 as it was the year that Achim Warmbold won in the BMW, rather an unexpected result at the time. 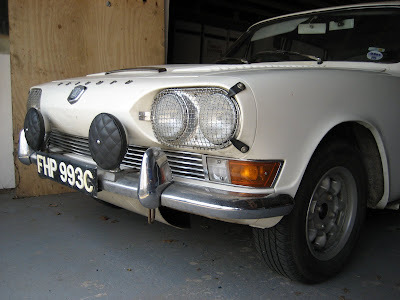 The story that I had from Brian was that the car was owned by some very wealthy pal of his who lived in the Channel Islands, Jersey maybe, with whom he had done the World Cup Rally and was now lending the car to Brian to drive on the TAP Rally. Presumably this was Adrian Lloyd-Hirst, but I can't remember the name. Brian had some job that he was having to do before the Rally and he couldn't get time off. I seem to remember being told that he had had a garage but had closed the business down and taken a job. I ended up working non-stop on the car for a few days before the Rally. One of the things I had to do was attach a large sheet of steel where the original boot floor had been. It had worn away completely on the World Cup rally leaving a hole about two feet square. I had not met Brian before this escapade, but was introduced by a chap called Mike Kyle (who serviced for us) since I was the only chap they could think of who had an International Rally competition licence and could take some time off. In retrospect it was a fabulous event, quite different to our British rallies of the era and so very different to modern WRC events (not that I've done any modern WRC events). As my late grandmother said near the end of her long life, it's the things she didn't do that she regretted not the things she did. nice story. Thankyou for sharing. BTW, did you finish the rally? UKV appears in a couple of Works posters, one produced by BL South America and another by BL Australia I think - it's another of the less photographed cars. The owner was described to me as a Coventry scrap dealer but that conflicts with oyther information I have. The car suffered some front suspension misfortune in South America, somewhere near Montevideo and apparently never made it back to the UK. The car was not built on works shell but car originated in the Triumph dealership in Berkely Square and was sold to Lloyd-Hirst by John McCartney. A quick check of my notes woul suggest that the car must have been XJB303H - Brian Neglefield bought 303 and 304 or rather the remains of 304 that Cowan rolled. He took 304's engine and put it in 303 apparently. I only say that as my understanding is that 304 was not put back together into a running car until last year when Pat Wlaker acquired it - but put me right if I'm assuming too much! Car 1 Was crewed by Bobby Buchanan-Michaelson, Roy Fidler & JIM BULLOUGH and not David Benson, Roy Fidler is still alive and kicking, see http://www.donbarrow...phy_stage1.html in the Ecurie Cod Fillet section. According to the GRO Death Index, he was born 6 Oct 1916. His death was registered in Surrey SW in Dec 1994. Thanks for the updated info chaps, much water under the bridge since I first posted. Car No 1 is now in safe hands having sat neglected for years. Don, what makes you say it was Jim Bullough? Only asking as I can't recall where I go the info it was David Benson! Don, what makes you say it was Jim Bullough? With DB being JB's regular navigator/co-driver, I guess he'd just know! I wonder if this Triumph was the prototype SD1. They could have used it to test all the gear for the solid rear axle SD1. Leyland Australia used a Holden to test all the P76 gear before they built the first P76 body. It sounds logical that BLMC used a Triumph to put all the SD1 running gear in as the front suspension was similar to the SDI and Triumph did a lot of the development work on the new Rover. Even the six cylinder optional engine was a Triumph 2500 with OHC. David Bache did all the styling but the rest of the car was Triumph [except the V8]. Even the gearbox was an Albion /Triumph effort. I doubt if there was a spare engine left although BL sent a Rover engine to Traco for them to modify. Now, the Marathon car came to Australia with two Traco F85 Oldsmobile V8 engines, so there must have been a Rover engine lying around somewhere. The first car JXC808D lost it's engine to the Marathon car and according to the West Coast USA Rover dealer, they built up a 4.4 litre Rover-based engine for it when it went to the US in late 1970 for the Motor Show. It was owned up until recently by BLMC collector Arthur Carter, who incidently owned the Mexico Triumph 2500 P1 as well. The new owner in the UK is loaning it to Vintage Racecar magazine who are doing an article on it soon. David Benson was originally entered, but with a few weeks to go Jim Bullough was drafted in to increase the driving force, I think Roy realised that he would be the only decent driver amongst the original crew and chose Jim whom he had rallied with on a previous Monte. I remember it quite clearly because when Jim told me about his involvement, I was pretty miffed because it interrupted our original plans for our competitive season. However, due to the poor reliability of the fuel injection system which caused problems right from the start in London, Jim was back in the UK much quicker than anticipated and only interrupted competing on two events......DB. Car No1 and the practice car, WRX 902H are both together under restoration at the moment, XJB303H is apparently for sale now, still in it's damaged state at Southern Triumph Services. Car No 1 - I call it that because it's had a change of reg and I'm not too sure what it should be called! It ran as DYE377H and was then registered EGC124H but it'll always be Car No 1 Anyway, there seem to be very few photos of this car either on the rally or at the start. Anyone got any views of it at all? This appears on the "Triumph" thread on Forum Auto. No indication as to whether it is TAP Rally, or any other useful caption, but appears to fit what is posted above. Didn't one of these ex-works Triumphs competed in the 1970 Hardie Ferodo touring car race at Bathurst with Brian Culceth and Lyndon McLeod? There is a photo of the car in the Great Race book. It had West Australia registration plates at the time. Further to my original post, here is an extract from the ECF Dec 2008 bulletin. KING COD’S WORLD CUP RALLY. Not many of you will remember that I was first on the 1970 World Cup Rally to Mexico! Not first to finish, but first to start at Wembley!! 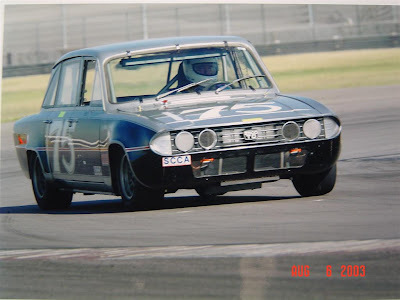 Robert Buchanan-Michaelson invited Jim Bullough and me to go with him in a Triumph 2000 prepared by Janspeed to works specification. Bobby was appropriately named because at that time he had a bob or three, as well as a large house just off the Kings Road in Chelsea, with an indoor swimming pool – and a butler! With great pride Bobby drove number one off the ramp inside the Wembley stadium, only for us to break down on Olympic way for about twenty minutes. He was not pleased! Only another 16,000 miles and 25 countries to go. London-Sofia-Lisbon-Rio-Mexico! A minor suspension trouble meant a rush into Sofia, so we had to top up with Bulgarian petrol. As they said in Apollo 13 “We have a problem”. Going downhill - fine. On the flat – slow. Uphill – dreadful. It did a few hundred yards and then stopped. We had to wait a few minutes then restart the engine and do another short stretch. We asked the Triumph service crews and others we knew to solve it, but no solution. Now there are plenty of uphill bits between Sofia and the control at Sigale in the French Alps. It seemed to take us days (it’s about 800 miles), but when we got there Tony Mason and the other marshals had shut up and gone home. Goodbye Mexico! The Triumph went well to Nice (downhill) where Bobby got the next plane to London, wearing overalls and carrying his crash hat. Jim and I stayed in Cannes for a few days, because Jim knew a few boat owners in the marina. He had owned one himself. (Crew of three or five depending how many bartenders you need). Cannes was no substitute for Rio, however. As consolation Bobby bought himself a soft top Roller. I tried very hard to find the cause of the problem. Then a few months ago, after 37 years, someone told me that he knew a mechanic who went to collect the car and he said he found the problem in no time. It was a fuel filter that had been fitted the wrong way round. The thread is all about the history of the Triumph 2.5 works Rally Cars, not the 1967 Gulf Rally. "The thread is all about the history of the Triumph 2.5 works Rally Cars, not the 1967 Gulf Rally." Bit prickly today Don? Must be the weather. As you might recall, Roy was in a Triumph on that event and from somewhere I had thought it was one of the prototype PI ones. Obviously not entered formally as a works car since the event 'had no trade support'... Apologies if I've offended your sensitive nature. Well the thread title is actually Triumph 2.5 PI rally cars, not Triumph 2.5 PI works rally cars. Thanks to the entry list kindly being supplied to us on this forum (something I had searched a long time for), it does appear the 67 Gulf car was a Gp2 2000 - but of course the (cancellled) 67 RAC "2000s" were actually Gp5/6 2.5PI prototypes, so it was a possibility that the Gulf car would have been too (2 of the works Cortinas on the 67 Gulf ran in that category and would have done on the RAC). A lot about the WCR 2.5 PIs here but nothing about the works Mk1 2.5 PIs on the 69 RAC. Narrowly lost the team award to a new UK-run Datsun team of SSSs? A lot of dashing around fitting and removing snow chains by BL (which I don't recall others using) and at one point we helped Bill Price out at the exit from the last Clocaenog stage by loaning our trolley jack - which was very small and intended only for the Mini Cooper we were servicing, not a 2.5 PI tank, and was never the same again...). Graham Robson's 'Works Triumphs' book describes the Gulf London car as a 2000- specifically Roy Fidler's ex-works (but with what Robson describes as 'arms-length support') FHP993C. Fidler used the car on British Championship events in 1966/7, winning the championship in '66. The spec isn't made 100% clear, but it started life as one of the Group 1 cars for the '66 Monte. "'FHP' was then upgraded to a prototype 2.5PI for the '67 RAC"
I am the Brian Englefield referred to in the above. I competed in the World Cup Rally in UKV701H. This was purchased by a Mr George Robinson, having been persuaded by Adrian Lloyd-Hirst, he, in turn, having been persuaded to make the pitch by my co-driver, Keith Baker. Adrian entered the rally in his name, (much to my annoyance at the time). Although meant to come to me after the rally, due to the death of George Robinson, the people settling his estate sold it to a Peter Barker in Jersey. It was an export model, LHD, and would have attracted tax if it had permanently stayed in the UK. This is an important point, as it was re-registered in Jersey by Peter, thus the reason it appeared to have disappeared from the face of the earth. Due to my faltering memory, I cannot be sure, but it was now J 6749, or J 6739, I think. I competed with Peter in the Scottish Rally, and then with Ian McKean in the TAP rally, (where the picture of the front of the car shown above came from, I'm sure). It ended it's days in Cornwall, rusted out as Peter did not collect it and wouldn't sell it to me. I bought these, and a brand new works prepared shell, from BL directly, with the original intention of building one car. However, I repaired the engine and suspension on 303, and fitted the new shell with the parts from 304 in their entirety, replacing only damaged parts with their correct parts, only from BL Competition dept. The engines remained in their correct chassis. I rallied both cars over the following years, one memorable event being the RAC where I competed in 304 with 303 servicing, quite memorable. I have a few pictures if only I could work out how to post them!, (What does[IMG]***[IMG] mean)? How do I get a stored photo from my documents into this format??? Try this, it is foolproof, as we have all proved. Page 9, post 351. Steve Mcqueen was to co-drive in a Triumph 2500 PI for the British Leyland team in the 1970 London-Mexico rally, but had to turn it down due to movie commitments . Might be irelavant but thought i'd contribute from my knowledge of the 2500 in 1970 . I can remember a couple of what I believed to be ex World Cup 2.5PIs from '71/72. One belonged to John Brundle (Martin's father), I remember it because he almost ran me over on the Rallye Dubonnet! (1972?). The other was run by Bill Douglas on MN events (I believe he was a motor trader from Northampton?). Yup, I did the TAP with John Brundle in one, and there was another chap from that area, Dutch I believe who also ran one, maybe the name will come back to me. Here you go Brian, here's one of your photos. Nice one - the Mk1 is the Monte car, FHP993C -badged as a 2 litre but it was run as a 2.5 with Lucas PI. The car is now owned by Bill Bradley who also owns a few other ex-works cars. 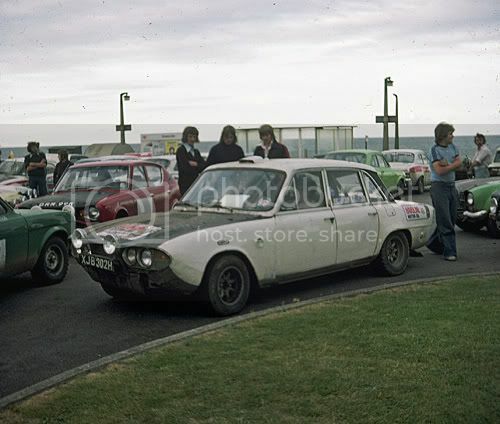 Here's XJB302H at the finish of the 1975 RL Brown Trophy rally, driven by Hartley Timmins. I think I've got another shot of it in a similar era in an old Rally Sport somewhere, if it's worth digging out...?